Long Island is a great place for a short weekend getaway, or a much longer stay giving you all the time you need to see the best of Long Island. 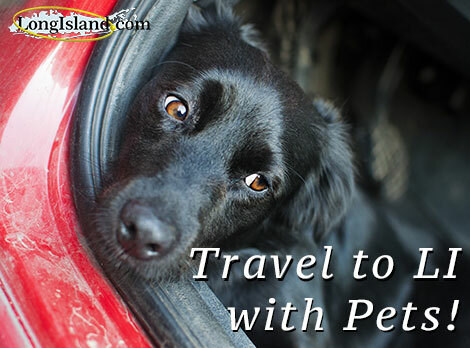 Whether you are coming to Long Island for a long or short stay with a pet, you’ll need to find pet friendly accommodations as well as pet friendly activities. Luckily, Longisland.com has already done most of the legwork for you. There's no better way to spend a lazy weekend than enjoying the great outdoors with your furry best friend. Check out this list of pet-friendly parks on Long Island to help you plan a casual weekend morning. Here is a list of pet friendly RV parks and campgrounds. Long Island’s beaches are among its most popular attractions. It’s hard to imagine this level of coastal diversity occurring in any other region the size of Long Island, and everyone wants to enjoy these areas – including our pets. But before you bring Fido to any of the village, town, county, state or national parks on Long Island, double check whether or not you pet will be welcome! Check out our list of pet friendly beaches in Nassau and Suffolk Counties. The fresh air and beautiful natural scenery make Long Island a great place to vacation with a pet. In order to save you the trouble of finding pet-friendly accomodations on Long Island, we’ve compiled a list of pet friendly hotels across Nassau and Suffolk Counties that will give you and your pooch the red carpet treatment.